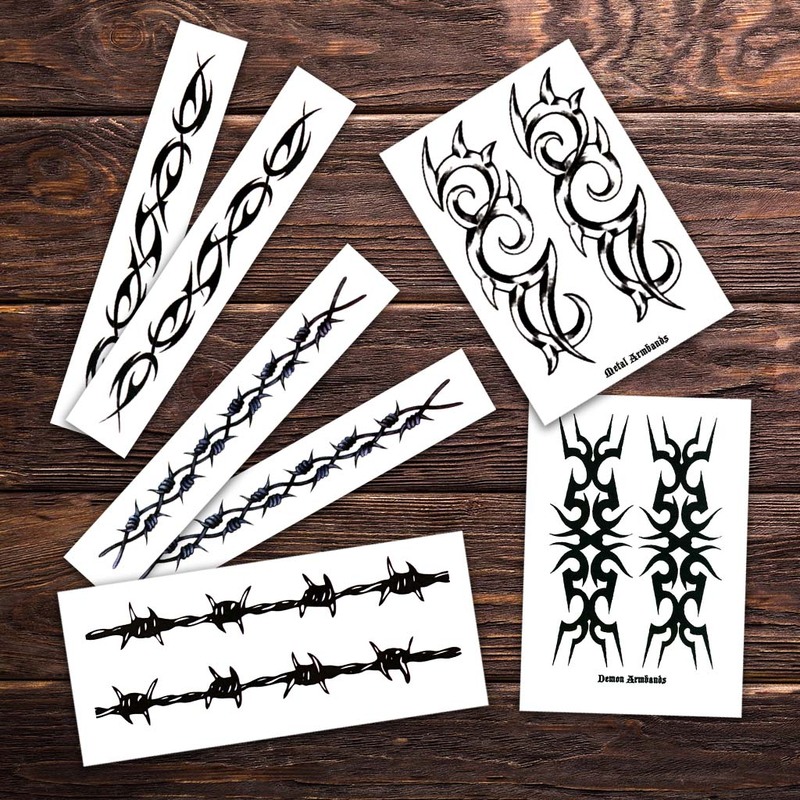 One of TattooFun.com’s most popular items are our Barb Wire Temporary Tattoos pack. These barb wire temporary tattoos seem to fly off the shelves all year round. 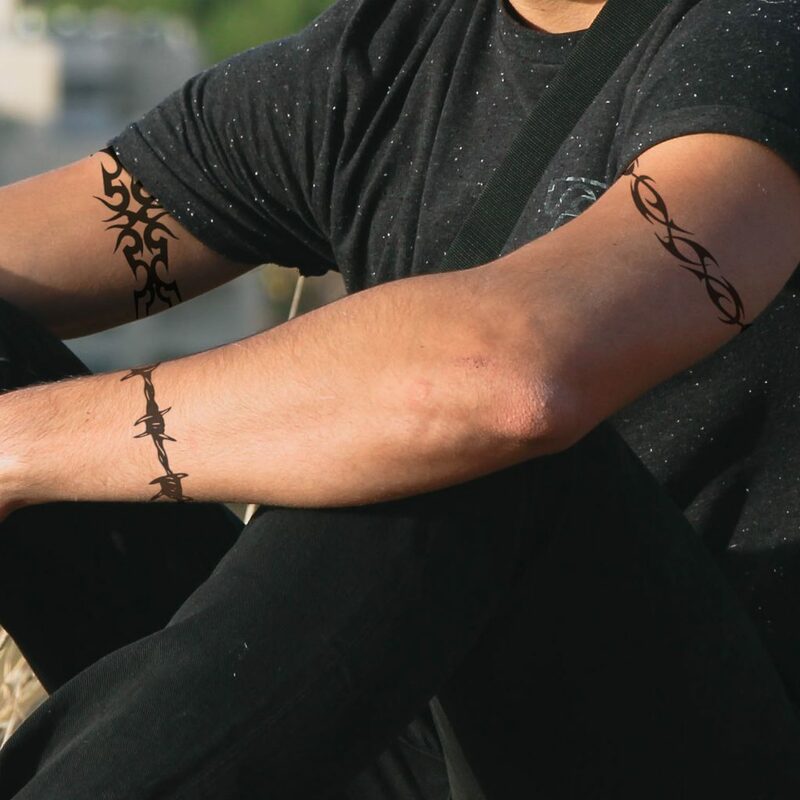 As a matter of fact, our customers are constantly mentioning how much they love our barbed wire temporary tattoos. People who wear barb wire temporary tattoos typically wear them to look rugged and unbreakable. Not only this, but did you know barb wire temporary tattoos can have other meanings? So what is the meaning of barb wire? What makes it a popular temporary tattoo? And what reasons are there to buy a barb wire temporary tattoo? Some of the answers to these questions may surprise you. One of the reasons to purchase a barb wire temporary tattoo is for religious reasons. Specifically, people purchase barbed wire temporary tattoos to represent the crucifixion of Christ. As Christ was crucified he was crowned with a ring of thorns and mocked. Barb wire can look similar to these thorns. For this reason, barb wire temporary tattoos can worn as a reminder of Christ. Thus, these temporary tattoos can symbolize and how a person feels about Christ. Of course, not everyone believes in this sort of spirituality and religion. For those who do, barb wire temporary tattoos can be a deep reminder of Christ. Some countries have a tradition revolving around barb wire tattoos and jail time. In these countries the number of spikes may represent how many years served. Each spike represents one year served. Using this method the number of spikes on a tattoo indicate how many years a person served. Moreover, at one point barbed wire tattoos also indicated a life sentence. If you are dressing up as a convict for Halloween, barb wire temporary tattoos might just be the way to go. As you play the character of a convict you could tell a story about your barb wire temporary tattoo. That way when your friends ask you about it you can say “It’s because I served 10 years, you can count the spikes”. Another option is to say “I was convicted to life in prison”. Have fun with the story behind your costume! Above all have fun with the story behind your barb wire temporary tattoo! Did you know that some rappers have barb wire tattoos? Post Malone has a barb wire tattoo across his forehead. 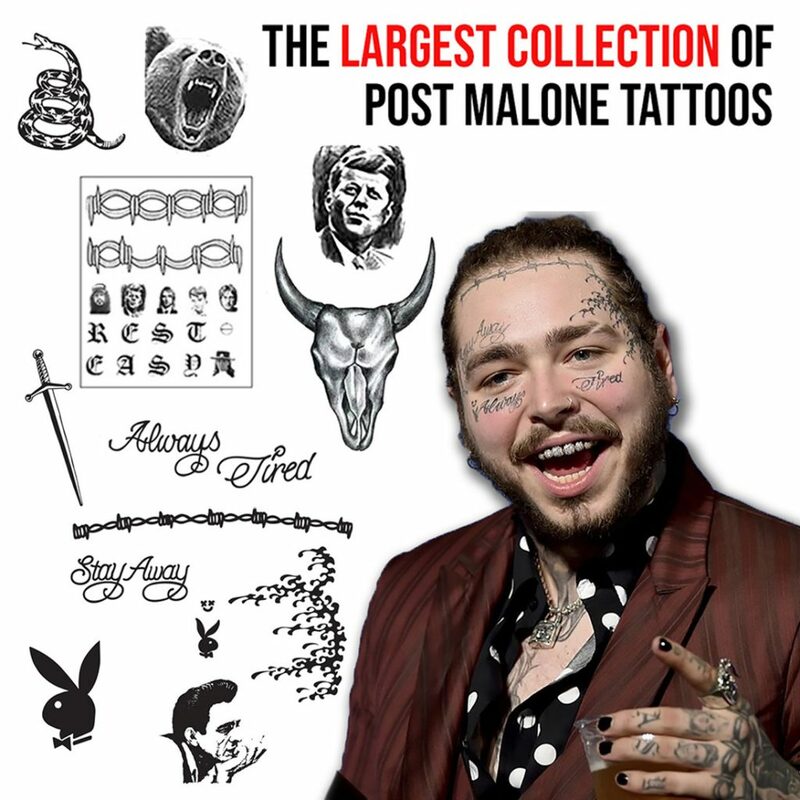 Thus, TattooFun.com sells a pack designed to resemble Post Malone’s Tattoos. If you want to wear barbed wire tattoos feel like a celebrity, TattooFun.com is the place to get them from. As a result, you can feel and look just like post Malone and wear his awesome Barb Wire Tattoo. Buying temporary tattoos from Tattoofun.com is affordable and fashionable. 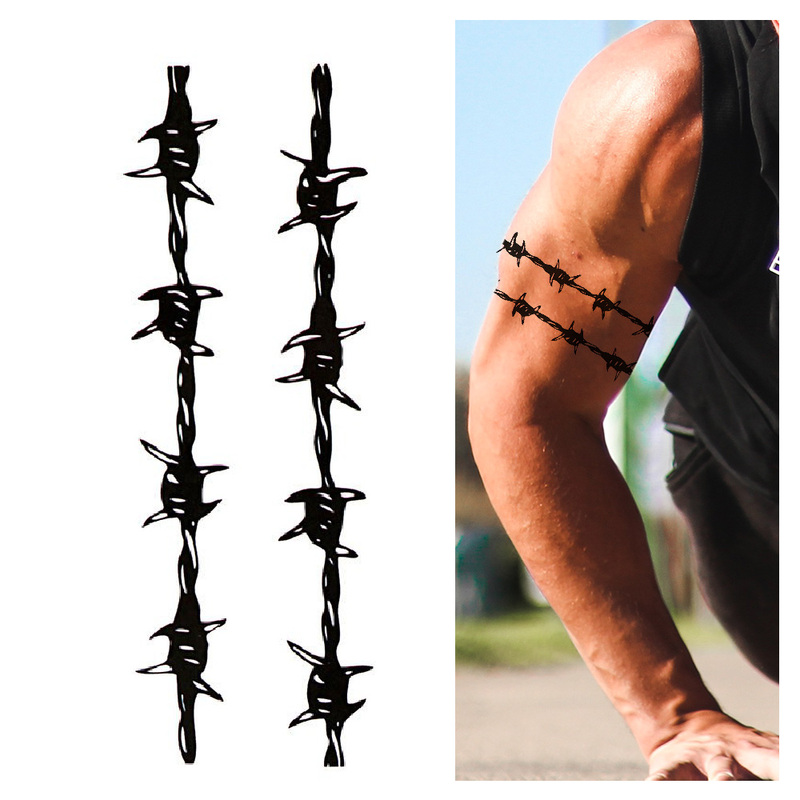 Furthermore, barb wire temporary tattoos are stylish, while also portraying a message to the outside world. Whatever that message may be, TattooFun.com can help you say exactly what you mean. 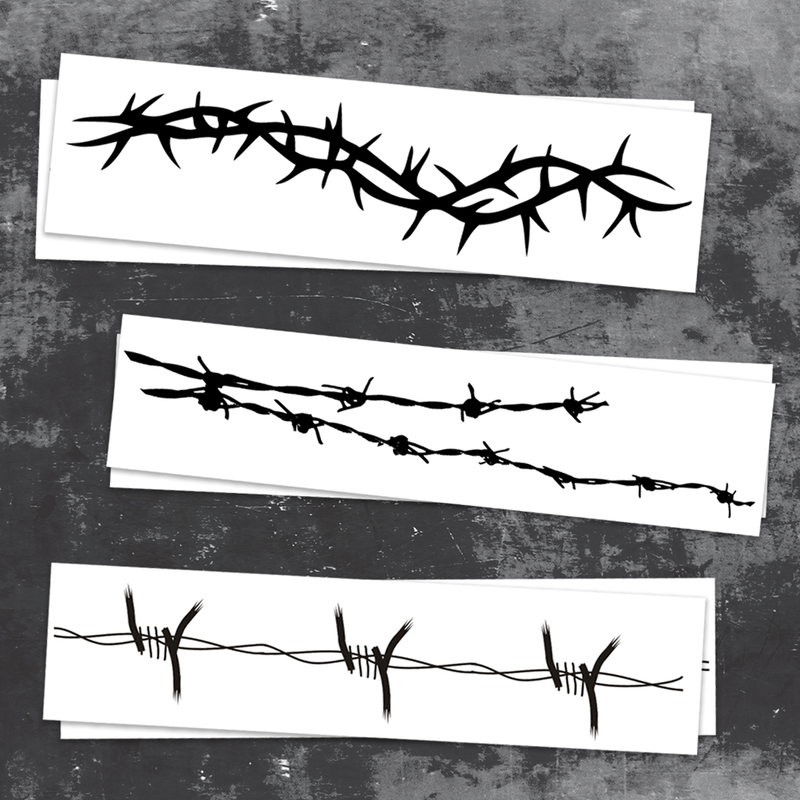 Need barb wire temporary tattoos for an upcoming event, but don’t love any of our in stock temporary tattoos? Our custom temporary tattoos would be a great option for you. You can make your own custom temporary tattoos to match whatever occasion you need barb wire temporary tattoos for. You can send in your own design, or have our graphics team help you with a design. If you do choose to have our team help with a temporary tattoo design a small graphics fee may apply. In conclusion, all of our barb wire temporary tattoos are easy to apply, and only require a little water! Simply put the temporary tattoo against your skin and apply a damp cloth to the backing for 30 seconds. The best part of temporary tattoos is they stay on for days, but can be removed anytime. Use rubbing alcohol or even a little hand sanitizer can sometimes do the trick for removal. There is also the option of tattoo removal formulas. We’ve been in the Temporary Tattoo business for over 20 years. Hence, we know a thing or two about the types of temporary tattoos are of interest. We ship millions of temporary tattoo sheets all over the globe each month. Above all, our temporary tattoos are proudly made in the USA with skin safe, FDA approved ingredients. Most noteworthy, TattoFun.com offers the best quality temporary tattoos, everyday low prices, excellent customer service, and your satisfaction is guaranteed!